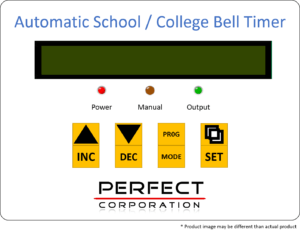 Our Automatic School Bell System is a simple yet robust. Schools, colleges, coaching classes, offices can use it for automatic bell ringing system. 25 types of bell settings (Periods) can be added for any day including Tea Breaks, Lunch breaks, short recess & Long recess & assembly. Bell duration can be individually set in seconds for example, short bell (3 seconds) and long bell (6 Seconds). There is also a provision for day selection viz Time Table can be defined same for all six days or same for Monday to Friday & special half day schedule for Saturday & Sunday holiday. Apart from automatic bell ringing it has a manual mode, which can be used in case of any deviation from predefined schedule or emergency use. Four push buttons are used to set the data (School timetable) and alarms, namely switch 1st is for increment, switch 2nd for decrements, switch 3rd for both programming and next (move cursor). And switch 4th for storing the data like (ok button) at each time when we altered the values. Three LEDs Red, Yellow and Green are used to indicate Power on, manual and output respectively. 16×2 LCD for the display time and alarms. It has an Inbuilt Real Time Clock (​​DS1307) which tracks over the Real Time and lithium 3v cell for the offline RTC storage. 25 different types of settings can be done for a given day. No additional battery required to maintain clock and stored program.